What the hell? 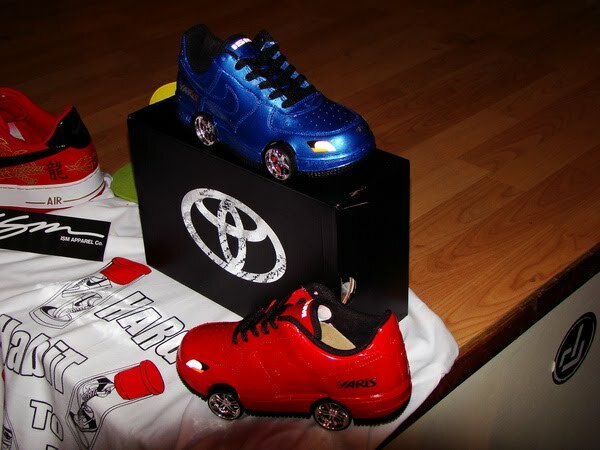 Toyota Yaris shoes are automotive apparel atrocities. What the what? Frequent Tweeter (@highmileage), automotive analyst, and social media guy, Adam Barrera, posted a Twitpic of these Toyota Yaris shoes. Hey, I love my Yaris, but these ... these are slightly terrifying bits of automotive apparel. A Google images search for "Yaris shoes" yielded some more photos, which can be seen at NiceKicks.com. I would not wear these, just so you know. Adam's a Great Guy and leave it to him to find the craziest stuff out there! Besides being an auto enthusiast, I was a sneakerhead as well...however, those AF1 Yaris shoes are nasty and would never wear those. The kicks look cool but definitely not everyone would love to have it. This Air Force Ones would possibly be picked by those who would always want something unusual. But in fairness to Nike, they do always have creative ideas.